On International Women’s Day, Laura Glenn O’Carroll, Research Associate at the Chicago Council on Global Affairs, outlines findings from their latest report: Girls Leading, which explores why investing in rural girls is critical for solving global hunger. It’s not easy being a rural girl. Across the globe, only 39 percent of rural girls attend secondary school, compared to 45 percent of rural boys. Most rural economies are based around natural resources, and girls are often the backbone of farming families; girls are largely the ones spending hours carrying water, seeking firewood, and caring for family members. But an adolescent girl is on the precipice of change. If she is able to remain in school, gain valuable skills, and stay healthy, she can earn an income and invest in her family and her community. If she stops attending school, marries early, and becomes a young mother, her ability to reach her full potential is curtailed. Her loss is our loss as well. The global community cannot advance without these key members. Recently, the Chicago Council on Global Affairs released the digital report, Girls Leading: From Rural Economies to Global Solutions, chaired by Catherine Bertini, that brought together over 20 diverse authors to share their perspectives on rural girls and their ability to break the cycle of poverty and hunger. This report builds on our 2011 report, Girls Grow: A Vital Force in Rural Economies. The authors draw from their experiences in academic, legal, NGO, multilateral, diplomatic, private-sector, medical, and technological backgrounds—plus personal experience—to both highlight the needs of rural girls and the solutions to the challenges that they face. Agriculture is a key lever of this empowerment. More than 60 percent of rural people live in poverty, and women and girls are overrepresented among the poor. By investing in rural girls— and allowing them the same level of access to land, inputs, financing, and education that their male rural counterparts receive—countries could unlock transformative economic development. It has been well documented that whole communities benefit if women earn higher incomes. When women work, they spend nearly all of their income on their family’s well being—nearly 90 percent of their earnings. By comparison, men invest only 35 percent of their income back into their families. This impact multiplies when millions of women are empowered, creating compounding effects that can reshape entire economies and national fortunes. 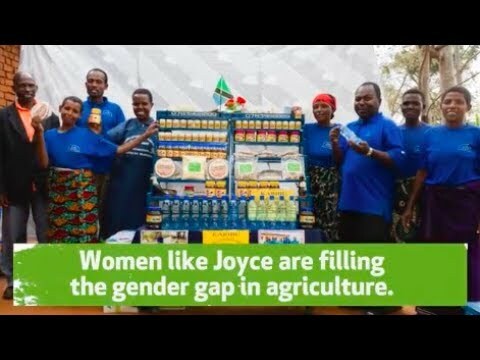 But female farmers, despite being 40 to 50 percent of the agricultural labor force, continue to see lower yields than male farmers. 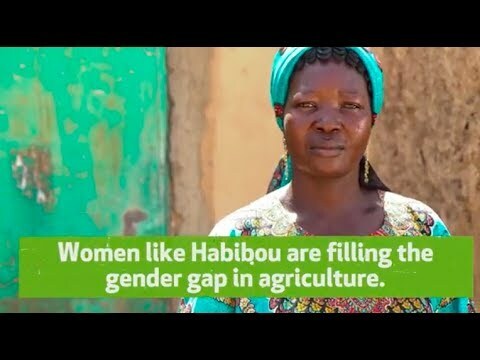 Female farmers are also burden with domestic roles as well, which can mean that customized support for training, child care, and more are needed in order to reach parity. In sub-Saharan Africa, women carry at least three times more tons per year than men—largely firewood and water—and are responsible for more than 70 percent of household labor. In Benin and Tanzania, for example, rural women work respectively 17.4 and 14 hours more than men each week. But closing the gender gap could increase agricultural yields by as much as 30 percent, which would mean higher incomes for rural families. Agricultural development is up to four times more impactful than investments in other sectors for reducing poverty. The world’s youth population—2.3 billion and growing—are increasingly living in low- and middle-income countries where economies are dependent on the successful transformation of agriculture. But infrastructure development is key to realising these gains in rural regions. The potential of rural girls in particular has not been fully realised, as low investment in rural infrastructure and education expansion in both high- and low-income countries disproportionately impacts girls. As climate change increasingly impacts weather patterns, these gaps will become even more impactful. As the least empowered members of their communities, rural girls are also the most affected by changes in the natural world. Already, nearly 80 per cent of people displaced by climate change are female and rural girls are disproportionately killed or displaced by natural disasters. Additionally, during long-term weather events, such as drought, girls often bear the impact of negative coping strategies. Early marriage rates increase during times of environmental crisis, and girls are often the first to be withdrawn from school when family resources dwindle. Women and girls are not simply victims, however. They are key actors who have vital knowledge of their community and environment. If girls do not have the ability to participate in decision making, access resources and opportunities that they need, or learn practical skills, half of the population will be unable to contribute adequately to climate change adaptation. Being on the front lines of climate change, girls have the experience and the opportunity to best identify solutions—but first they must be empowered with education and a voice in their communities. Only by supporting the human rights of rural girls will the global community benefit from their talents and ambitions. On the International Day of Women and Girls in Science, Keri Carstens, Global Regulatory Lead – Seed Applied Technologies & Biologicals at Corteva Agriscience, speaks to Farming First about how we can encourage women into agricultural research. From water scarcity, to pests and diseases that move into new regions and devastate crops, to access to information technology resources, the challenges faced by farmers around the world are complex and ever-evolving. To solve these problems and enable food production, we need the best and brightest minds working in agricultural research. We need new ideas and diverse viewpoints. The International Day of Women and Girls in Science highlights the great need for women in science, and promotes the impact they can have. I grew up on a multi-generational farm in Iowa; my family produced corn, soybeans, beef cattle, hogs, sheep, and the occasional hay and oats crop. My dad was a science teacher before he came back to farming full-time. Early on he got me interested in the technical and scientific aspects of farming, by describing the types of equipment and crop protection tools he used, and answering my endless “why” and “how” questions. For many years, I was certain I would become a veterinarian, so I pursued a pre-veterinary biology degree. One summer during my undergraduate studies, I applied for a Program for Women in Science and Engineering summer research internship. I was accepted and was assigned to a lab that does pesticide toxicology and risk assessment research. This area of study is the interface between the tools farmers need, like pesticides, and protecting the environment. I fell in love. I have always had a passion for agriculture and the environment, and that area of study sits at the very nexus of the two, helping farmers to make decisions that will protect their harvest and environment at the same time. That summer, I decided that my next steps would be to pursue a Ph.D. in pesticide toxicology, and a career in the field. I now work at Corteva Agriscience, Agriculture Division of DowDuPont, and I serve as Global Regulatory Lead for Seed Applied Technologies and Biologicals. Around the world, there are special regulatory processes required for each pesticide used as a seed treatment to prevent food loss. My job is to coordinate with the team of scientists and regulatory specialists around the globe to make sure we do the studies we need to demonstrate safety and efficacy of the seed treatment products, and that we deliver those data to regulators so they can make a decision about the new products we are proposing. In addition to this work, I have the opportunity to lead our company’s engagement around pollinator stewardship. I love my job. I work at the intersection of agriculture, science and environmental stewardship, with the goal of enriching lives of farmers and consumers, so we all see sustainable progress. And, every day I am amazed at the number of smart, compassionate, fun, diverse people I have the opportunity to work with – all who care about the same things I do. While barriers remain, I believe the situation for women in science has improved over where it has been historically. Around the world, movements like the International Day of Women and Girls in Science help to highlight the gaps that remain, but more importantly, the achievements of women in STEM fields. These are important steps in the right direction. The old saying “to see is to believe” in many ways applies to inspiring the next generation of scientists; young people need to see people like themselves in careers to feel inspired and empowered to pursue the path. At the same time, that bolstered my initiative to pursue internships, or new roles. One example from my own past that I would highlight – during my undergraduate studies at Wartburg College, I worked in a professor’s biology lab a few hours each week, conducting very basic experiments for some extra money. This man had unbelievable patience with me, while I trialled new CO2 probes and re-ran experiment after experiment for a small-scale study I was conducting. All along, he encouraged me to try new things and take my time, so that I could learn. What he was teaching me was the basic research process. To this day, I credit Dr. Ventullo as instilling in me the confidence to apply for the summer Women in Science research internship, which led to my “discovery” of the field of toxicology, which became my career. It can be as simple as one person’s words of encouragement. And, if each of us can play that role for one young woman, we will make a difference.